559 pages | 113 B/W Illus. Written with medical statisticians and medical researchers in mind, this intermediate-level reference explores the use of SAS for analyzing medical data. Applied Medical Statistics Using SAS covers the whole range of modern statistical methods used in the analysis of medical data, including regression, analysis of variance and covariance, longitudinal and survival data analysis, missing data, generalized additive models (GAMs), and Bayesian methods. The book focuses on performing these analyses using SAS, the software package of choice for those analysing medical data. Its breadth and depth, coupled with the inclusion of all the SAS code, make this book ideal for practitioners as well as for a graduate class in biostatistics or public health. "Each chapter in the book is well laid out, contains examples with SAS code, and ends with a concise summary. The chapters in the book contain the right level of information to use SAS to apply different statistical methods. 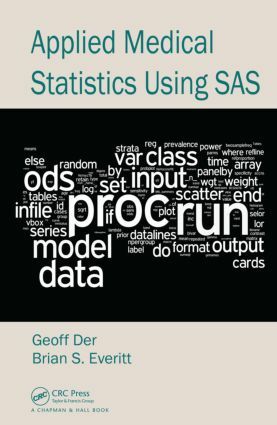 … a good overview of how to apply in SAS 9.3 the many possible statistical analysis methods." "… a well-organized and thorough exploration of broad coverage in medical statistics. The book is an excellent reference of statistical methods with examples of medical data and SAS codes for statisticians or statistical analysts who are working in the medical/clinical area. It also can be a reference book for an introductory or intermediate graduate biostatistics course." "A recent request to a statistical professional body by a doctor seeking help with analysing data they had collected was greeted with derision by some of the members of that body. … The doctor in question may have been better served by simply purchasing this wide-ranging and accessible book. Medical students would also appreciate the range of topics addressed. … I think consultant statisticians would also appreciate the refreshers/introductions to statistical techniques and the SAS code for each. Indeed SAS code is liberally scattered throughout the text, and a couple of SAS macros are referred to in the meta-analysis chapter. … The text is supported by ten pages of references and a sizeable index. The code and example data sets can be downloaded from the SAS website." "Applied Medical Statistics Using SAS is a thorough documentation of statistical methods, inclusive of medical data sets and SAS code. The book would make an excellent reference guide for medical data analysts with access to base SAS 9.3 or a textbook for an introductory and intermediate graduate biostatistics course. … [It] comes to the market at an appropriate time in the extension of statistical applications to the medical industry … The thoroughness of procedures and the consideration the authors included in the selection of graphs, SAS code, and theory allow this book to be a resourceful companion for medical analysts. If looking for a broad selection of medical analyses using base SAS 9.3, this is the book for you; in addition, if a particular topic is required for further analyses, the book references additional sources." How Many Participants Do I Need in My Trial?